On November 5th there are a number of quick and easy Bonfire Night Crafts that you can make. 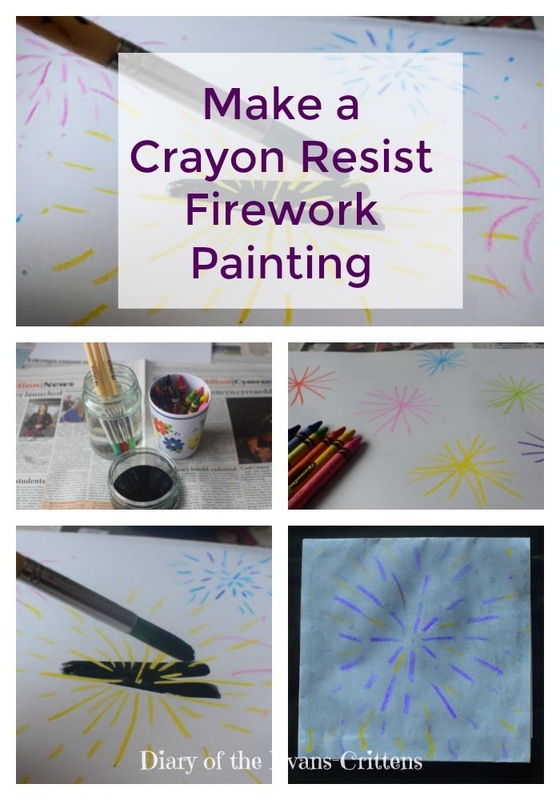 One of our old favourites is painting crayon resist firework scene pictures. They are easy to make even for early mark makers. or draw curved lines. A variety of different fireworks looks great and you can even add a simple bonfire. Next paint over the whole sheet with a black or dark blue watercolour (you can mix poster paint with water if you don’t have watercolour paints). Crayon resists water so your crayon pattern resists the paint. This technique very quickly makes effective Bonfire Night paintings. Display them to decorate your home for Bonfire Night. This crayon resist technique is also great for secret messages. Write a message in white crayon and ask a friend to paint over to read the message. I used to write my kids names for them to paint over while they learnt to read and write their names too. What Bonfire Night crafts have you made this year? Have you made a Guy? Such a fabulous idea! We'all have to try this out next year! Looks great fun, my neices and nephews would love to do this when they come and visit! Lovely technics. Thanks for sharing a video. Will give it a try.